Not only is cutting tough meat, fruits and veggies time-consuming, but it’s also quite tricky, especially when you want to get perfectly straight lines and slices. That’s where an electric carving knife comes in handy. It will do all the work for you, only much faster. Plus, it will deliver reliable and precise results each time. 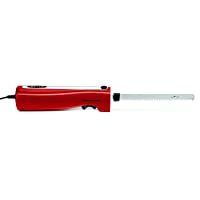 With all the models out there, finding the Best electric carving knife for your needs can be an intimidating task. But these are, in our opinion, the best ones, and here’s why. If you do a lot of cooking and want to have an efficient and safe electric carving knife, the Cuisinart CEK-40 might just be the thing you need. What makes this electric carving knife stand out from the crowd is its performance. A powerful motor makes any carving or cutting job precise and fast. Stainless steel blades won’t need sharpening and won’t rust over the time. Whether you cut tough meat, slice veggies, or bread, this knife will deliver consistent results every time. Moreover, its electrical cord is 4 feet long, which means that your movement around the kitchen won’t be limited. In fact, the cord will give you maximum flexibility so that you can do all the carving you want, as efficiently as possible. Another great feature that this knife has is the safety button. When you don’t need to use a knife anymore, you can simply lock the safety button, preventing adventurous kids from turning it on. 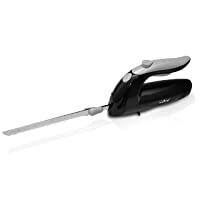 Honestly, if you want the best electric carving knife possible, you won´t go wrong with this one. As for the design, this is one professional-looking electric knife. Polished wood block storage tray, stainless steel blades and a black handle make this knife a nice addition to any kitchen. Although the ergonomic handle is comfortable, if you have smaller hands you might find yourself struggling to control the knife. It’s just too big for smaller hands. When cutting tough meat, the knife tends to heat up. This means you’ll have to turn it off for a while. After it cools down, you can continue with slicing. If you need a good electric knife, but don’t intend to use it for extended periods of time at once, then the Hamilton Beach 74250 is the way to go. This carving set includes the knife, blades, and fork, allowing you to carve and serve your breakfast, lunch, and dinner in style. Two serrated blades work at a high speed to deliver precise and fast results, making this knife a good choice for slicing all types of bread and for cutting meat. The blades are made from stainless steel, so they don’t require sharpening and won’t break. Also, they remove easily, which makes cleaning convenient and simple. Even though the fork is dishwasher safe, the blades aren’t. You should hand wash them in warm, soapy water, otherwise, the blades’ quality could decrease. You won’t have to worry where you will store the knife, as it comes in a handy case. The case will save space and will keep the knife, blades, and fork in one place. Best of all, the parts will be safe and sound, since the case is made of plastic and features foam padding molded to fit the set nice and snug. Although the manufacturer says that the handle is non-slip, the knife can slip if you´re not careful, so do pay attention. Another thing to keep in mind is that the knife isn’t comfortable when you use it for long, as it could have been more ergonomic. If you’re looking for an easy-to-operate electric knife, but don’t want to spend a fortune, the EK 700 might be the Best electric carving knife for you. Compared to the previous models on this list, this knife is not as durable. Because of this, you probably don’t want to use it on tough meat. However, the knife does a nice job slicing bread and veggies because stainless steel serrated blades allow for even and fast cutting. Moreover, you’ll appreciate its ease of use. 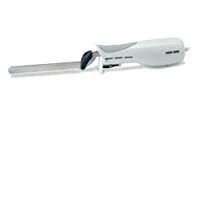 The knife features an ergonomic handle that provides control and comfort needed for easy slicing. In addition, the safety lock button makes the knife completely safe. You won’t have to worry about accidentally turning it on while the knife is plugged in. Thanks to a blade release button, the blades are easy to remove. Additionally, they are dishwasher safe, making the clean up swift and easy. This is especially useful when you’re in a rush and don’t have time to wash the knife. Simply remove the blades and place them in the dishwasher, and let the machine do the cleaning for you. Unfortunately, the knife has only 1 speed, so you won’t have the luxury to cut at a lower speed. The NutriChef PKELKN8 is powerful and lightweight, so it makes short work of cutting almost any kind of meat, while also being easy to use. 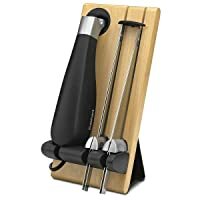 Because of that, this model is a good choice for anyone who deals with hand or wrist pain (for example, arthritis) as well as for anyone who enjoys eating tough meat, like game or simply likes his steaks well done. With a 120V motor, stainless steel blade, and extra-sharp serrated edge, this electric knife cuts easily, accurately, and swiftly. You can use it for Turkey, Pork, Chicken, and Steak. What’s more, the knife does a great job when it comes to de-boning. Although the knife is powerful, its selling point is actually safety. The knife has a raised handle, which means that the level of safety is increased. Moreover, you have to press the upper and the bottom switch at the same time in order to operate it. Another thing that contributes to its safety is its ease of use. As mentioned, the knife is lightweight so you’ll have better control over it. Plus, you’ll be able to use it for longer, without your hand getting tired. A slight concern is that the cord is too short. This can make cutting a tad more difficult since you won’t have that much freedom of movement. With the Bella electric knife, you won’t ever again have to struggle to make dinner for your family and friends. This knife will carve and slice effortlessly and evenly every time, leaving your loved ones impressed. More importantly, you will do all the cutting work in half the time it would usually take. The knife features a 120-watt motor, meaning it’s powerful and capable of cutting ham, Turkey, game, Pork and, really, anything. The knife comes with two blades – a carving and bread blade. With a 7.75″ carving blade, you can choose the thickness of the slices. 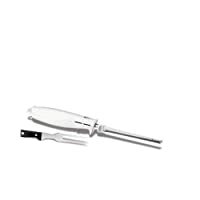 This allows you to quickly prepare meat for roasting, grilling, or cooking. The bread blade attachment makes cutting slices of bread a piece of cake, without deforming the bread. Also, you could use this blade for slicing fruit and veggies. A slight concern is that the knife is a bit heavy, so your hand might get tired quickly. This model also comes with a useful storage case so you won’t have to worry if the knife and blades will get lost. In addition, the knife and blades will be protected in the case. You could keep the storage case in the drawer or on the countertop. Either way, it won’t take up a lot of space.